UCLA's basketball legend John Wooden, who recently passed away just shy of his one hundredth birthday, was a "coach's coach." His great admonition, "Failing to plan is planning to fail," is a constant refrain in my own coaching advice. The important part of Coach Wooden's message is not that everything can be anticipated; rather, it's that, if you make no effort to anticipate at all, life will constantly come as a very unpleasant shock. I frequently chide my wife for thinking of all the horribles that could befall us. I suggest that she should have been a law school professor, creating hypotheticals that cannot be resolved. Her response? You can't avoid the potholes in life without planning to do so – you can't create your plan for the good life without also thinking about what could go awry. Apply this thinking to what too many law firms think cannot be planned – the amount and type of revenue they take in. A firm that does not decide what kind of practice it wants will wind up with one reflecting whatever walks in the door. It is doubtful that serendipity and whim are the best paths to success. A self-sustaining plan expresses in financial terms the firm's objectives and goals for the clients it wants, and the revenue it wants those clients to generate. A statistical premise called the Pareto Principle holds that, over time, most results are produced by only a few causes, generally in a proportion of 80 to 20. 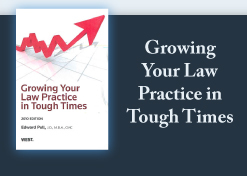 When applied to law firms, this produces the conventional wisdom that 80% of a typical firm's revenue is produced by 20% of its clients – the large, heavy hitters. Every firm should know in exact detail the work done for its largest clients, how profitable that work is for the firm, and what opportunities exist to get more work. That means you should be able to answer fundamental questions about the products and services, customers, financial health and employee demographics of any major client. If you can't, the client will soon realize and likely resent it. And you could lose a major revenue producer. The loss of a large client is such a major risk that making sure no single client exceeds 10% of your total revenue may be wise. Too many firms focus on a very few, larger clients and are severely damaged when the fees from that client fail to continue – from dissatisfaction, change of billing attorney, merger, recession, or other unanticipated problems. Some firms believe that having numerous small clients leads to greater revenue stability. However, studies suggest that small clients drain too many firm resources while providing too little profitability. Larger clients mean more revenue and more interesting challenges. But they must be balanced to assure that the firm is not at risk if some or even all should leave. You may be willing to accept this risk for the short-term with the intent of getting more clients so that the percentage allocation to the "larger" client is reduced while maintaining the billings at the same level for the client. If so, make no long-term capital or other expenditures at the behest of larger clients without some type of assurance that their business will stay with you until at least the amortization for the new expenditure is completed. Otherwise a long-term strategy based exclusively on fewer, larger clients will almost always lead to disaster. We are traveling along the Oregon and California coastline. Currently on Redwood Highway. These redwoods are among the most incredible living things ever seen by man! They are truly majestic. Talk with you next week.